For nearly two decades the Ports-to-Plains Alliance has been working hard to improve transportation infrastructure throughout North America’s agriculture and energy heartland. To date nearly $2 billion has been invested in expansion construction projects along the corridor. For the past two years we have entered the next phase of our efforts by seeking the extension of Interstate 27. Our members have supported us by joining us as signatories on support letters and voicing their support to their legislators and department of transportation officials. Today we are asking them to join us in taking the next step. 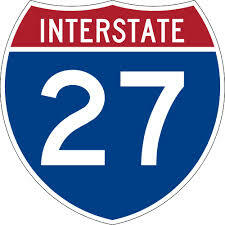 This week we are sending our members a sample resolution of support for the extension of Interstate 27. We are asking city councils, county commissioners’ courts, chambers of commerce and other civic groups to pass this resolution and let their legislators and the Texas Transportation Commission know that extending I-27 is a top priority for West Texas. We have also set up a web page for individuals to contact these decision makers as well. You can follow this link to go directly to that page. The key to our success has been the unified support of our grassroots members. Now we must continue to be vocal and speak loudly with a unified voice to be successful in seeing Interstate 27 extended. We may be outnumbered in rural efforts, but if we continue to work together we will accomplish great things. Texas does not have a major North-South interstate west of Interstate 35. Where Interstate 69 can serve as an alternative for freight moving to the northeast, an extended I-27 can be an I-35 relief route to the northwest. Texas does not have a major north-south interstate west of the very congested Interstate 35, and the Ports-to-Plains Alliance would like that to change. The Alliance has created a committee of West Texas mayors and community leaders that is leading the effort to unite the region behind the initiative to extend Interstate 27 and is asking West Texas city councils, county commissioner courts, chambers of commerce and other civic groups to pass resolutions of support for the extension. Ports-to-Plains is distributing a sample resolution of support to its members, and is asking them to forward it to federal and state legislators as well as the Texas Transportation Commission. Individuals may indicate their support at www.portstoplains.com. “This is a long-term proposition, but that means it is important for us to take the first step and seek a future interstate designation for an extended I-27 today,” said Reeves. The current 124 mile I-27 between Lubbock and Amarillo was designated as a future interstate in 1968 and was not completed until 1992 at a total cost of $453 million. The Ports-to-Plains Corridor is nearly 1,000 miles long in Texas and the cost to upgrade that entire corridor to interstate standards is estimated at around $7 billion. To upgrade the approximately 500 miles from Lubbock to Laredo to interstate standards is projected to cost around $5 billion. However that is quite cost-effective when compared to the $4.8 billion it cost to rebuild a 28 mile section of I 35 E from I 635 to U.S. 380 in Dallas County. U.S.-Mexico trade had doubled since 2004 and approximately 60% of U.S.-Mexico trade crossed at a Texas land port in 2015. Laredo is far and away the largest land port and Eagle Pass ranked third in Texas. Much of that freight moves up I-35 and has led to a tremendous increase in congestion. The Interstate 35 segment through Travis County is the number 1 ranked corridor for truck congestion in the state. The proposed extension of I-27 connects major West Texas population and economic centers including Amarillo, Lubbock, Midland-Odessa and San Angelo in addition to numerous smaller communities. It will cross I-40, I-20 and I-10 and serve three border crossings with Mexico at Del Rio, Eagle Pass and Laredo. An extended I-27 will be a major backbone for the energy industry in Texas serving top oil and gas producing counties as well as the growing wind energy industry. Furthermore, it will serve the agriculture industry including many of Texas top counties for the production of cotton, cattle, corn, grains, sheep and goats and other commodities. The Ports-to-Plains Corridor is a Congressionally Designated High Priority Corridor that extends from Denver to Laredo via Intestate 27. The Ports-to-Plains Corridor Coalition has worked to upgrade the corridor to four-lane divided with truck relief routes where needed. Those efforts have led to almost $2 billion in upgrades to the nine-state corridor. Will 2017 Be the Year for Surface Transportation? Two major topics look to be on the horizon by both the new administration and the 115th Congress: President Elect Trump's Infrastructure Plan/Concept and Tax Reform. Both topics could have a significant impact on future transportation funding and the development of the Ports-to-Plains Alliance corridors. We have significant work to do as the current concept moves to plan and implementation. $1 trillion of infrastructure improvements over 10 years would be significant. There are, however, some discussions that need to be held. The first is: What is defined as infrastructure?" The line is forming to be included as "infrastructure". How much of that funding that will go to surface transportation is unclear. We need to be sure our congressional delegations understand the importance of surface transportation to the economy and competitiveness and that they are taking that message to their conferences, especially conservative conferences/caucus and directly to the Administration. The second is: Where will the funding come from? The concept for funding this is based on private money. Money that would be paid back... see tolling. While a great concept for large urban areas, Public-Private-Partnerships (Ps3) are not an answer to rural surface transportation. It must be clear to the new administration that it was not these large urban areas that carried the election. It was rural America and the Infrastructure Plan must address rural needs. Again, we need to be sure our congressional delegations understand this and are communicating it to the conservative conferences and caucuses as well as the new administration. Tax reform brings an opportunity to establish a long term fix to the Highway Trust Fund. As we have seen in the past years, the majority of our congressional delegation understands the need to fix the Highway Trust Fund but is unwilling to support a stand-alone fuel tax increase. The current administration and Congress ignored the report of the Simpson-Bowles Commission which combined with $4 trillion of proposed budget cuts also included a 15 cent fuel tax increase. American Association of State Highway and Transportation Officials (AASHTO) and the American Association of Port Authorities (AAPA) released the State of Freight II: Implementing the FAST Act and Beyond. The role and connectivity of interior states in the national rural freight network continues to grow, as Kyle Schneweis, Director of Nebraska Department of Roads, stated in a Senate Commerce Committee Field Hearing, Keeping Good’s Moving in America’s Heartland. "The FAST Act is truly significant. For the first time, state DOTs will receive freight formula funding. As, you know. Senator Fisher everything is local in Nebraska and most local concerns are impacted by challenges in our rural communities. When it comes to freight challenges, we don't have the same challenges that our friends in more coastal and urban states face; we don't have congestion and bottleneck issues, what we have s, access and connectivity issues." Along with providing freight connectivity for manufacturing and agriculture in rural regions of the country, the economy is experiencing growth in the domestic energy sector. In 2014, energy commodities accounted for 54.2 percent of the 1.4 billion short tons of foreign trade cargo handled at U.S. ports and which is moving through our interior states. These energy commodities move almost exclusively in chartered vessels and are unaffected by the international carrier alliances. Last year Congress lifted a 40-year ban on exporting crude oil. While it is too early to forecast what the national impact will on our economy, the increased energy production has already been felt on the freight network in states like North Dakota. In order to attain low costs, efficient transportation is required to move commodities to market, materials to industry, or products to consumers. To maximize this efficiency, the Nebraska Department of Roads (NDOR) has identified statewide expressway corridors that link the state’s larger communities together with other major transportation corridors. Every region faces transportation challenges. In western Nebraska the largest challenge is connectivity. When complete, the Heartland Expressway corridor will link the largest cities with Interstate 80, allowing an uninterrupted flow of commerce. The department’s commitment to constructing this corridor began in the early 1990’s with a systematic approach to design and construction that continues today. 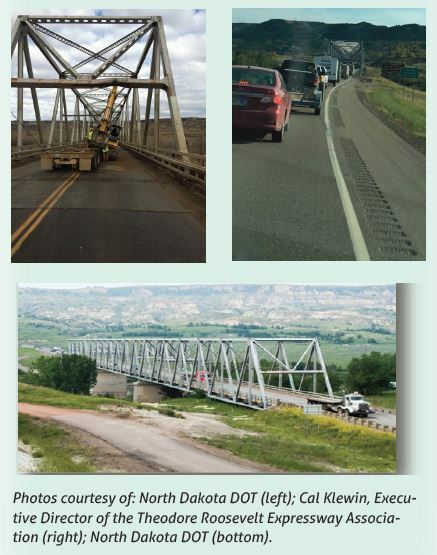 In 2014, the North Dakota Highway Patrol reported oversized truck permits issued for U.S. Highway 85 averaged 200 a day exceeding more than 72,000 overwidth, overheight and/or overweight vehicles on the road. Non-truck traffic averaged 20,900 per day north and south of the Long X Bridge. Traffic increased due to oil and gas development and agriculture production. From 2006-2012, vehicle traffic jumped 454 percent and truck traffic increased 565 percent. All of the growth has been accommodated on a rural two-Iane highway. Interested in supporting the Ports-to-Plains Alliance and Support I-27 Expansion Advocacy Work? The above graphic will be included in the January issue of Equipment Today and will be distributed at the World of Concrete show in January. 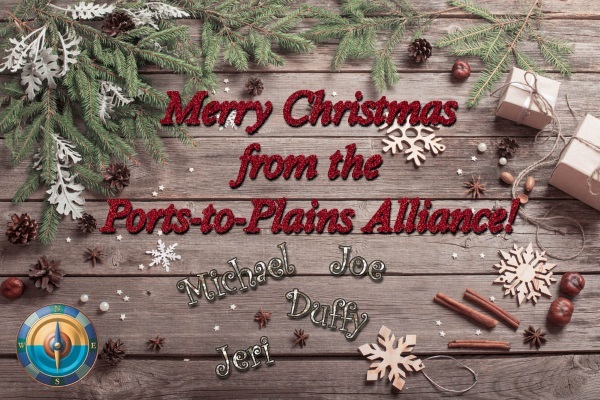 Click here for more information on Ports-to-Plains Alliance membership.